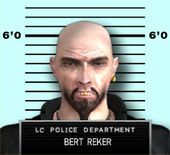 Bert Reker is an Angels of Death biker residing in Liberty City in 2008 and is wanted by the Liberty City Police Department for drug trafficking. He hides out in a junkyard in BOABO in Broker. Reker can be killed by Niko Bellic, depending on the player's choice. This page was last modified on 26 February 2014, at 03:32.